Even with all the incredible advancements of medical technology and research, cancer remains one of the leading problems of modern health. Melanoma is one of the most common types of skin cancer and is the most dangerous, especially when victims overlook the early symptoms. It is accountable for more than ¾ of all skin cancer related deaths. More than 76,000 cases are expected to develop in the United States in the following year alongside almost 10,000 melanoma related deaths. Melanoma rates have consistently risen in previous years, but learning how to spot it early can save your life. Detecting melanoma in its earliest stages can significantly increase your likeliness for survival. People who began treatment in the earliest stage have a five year survival rate of almost 100 percent and a ten year survival rate of about 95 percent. In the worsened stages those numbers drop to about 15 and 20 percent. Overall melanoma is much more commonly developed with older people. However this doesn’t mean younger people are exempt. It is one of the most common types of cancer to affect people under the age of 30, particularly women. According to the American Cancer Society, before the age of 40, the risk is higher for women, while after this age the risk is higher in men. It is more likely for a young female to get melanoma, probably because of tanning, but overall men have a worse outcome when compared with females. The reasons for this difference is yet to be understood. Moles are small brown clusters of pigment cells that group together on the skin and are fairly common among the average adult. The majority of moles pose no risk to your health but melanoma can develop in a once healthy mole. 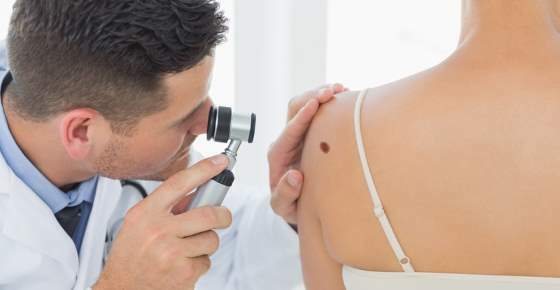 There is also a type of mole called a dysplastic nevi which is a benign mole, but people who have these moles are at increased risk of developing melanoma. This is believed to be one of the most common contributors of skin cancer. Exposure to UV rays from tanning salons and direct sunlight can lead to damage in the genetic makeup cells of your skin. If the rays damage the DNA regulating the growth of skin cells, it can quickly lead to cancer. There are several types of UV rays but none of them are safe for the skin. Caucasians with light skin tones are much more vulnerable to the effects of melanoma. Red and blond hair as well as freckled pale skin are indicators that you may face a higher risk. Approximately one tenth of patients diagnosed with melanoma have some sort of genetic history. The hereditary condition can easily be passed down to younger relatives. Ask around to find out if members of your family have dealt with melanoma. With any type of cancer acting sooner than later has favorable results. This holds especially true for Melanoma. B – border irregularity – black skin spots, dark patches, moles, or large freckles that have an irregular border or blurred outline. The best way to keep this dangerous form of cancer out of your future is to know the sources and take small preventative measures. Some age groups and genetic factors might make someone more susceptible but nobody is completely immune to melanoma skin cancer. Curb Your Tanning – If you tan often, whether in a booth or outdoors, it’s a dangerous hobby and it will cause dark skin spots. Your skin isn’t prepared to absorb solar radiation for prolonged periods of time. Use Sunscreen – Regular application of high factor sunscreen will make staying outdoors all day a safe experience. As for sun exposure to get more vitamin D, read my article about vitamin D deficiency. Outdoor Timing – As the sun shifts from East to West throughout the day, the intensity of its rays differ based on the angle it hits the earth. The hours between 10:00 a.m. and 2:00 p.m. experience the most intense sunlight and are best to be avoided to ensure safer skin. Grab Some Shades – A pair of UV blocking sunglasses can be more than a slick accessory. They also help block out the UV light and protect your eyes. Seek Shade – areas of shade are like nature’s sun shield and offer a great protection from sun exposure. If you must be outdoors, cover up with a T-shirt and a hat. Sadly some people are still unaware that the sun is a lifeline as well as a deathline. There are plenty of organizations like the American Cancer Society that fund cancer treatment and preventative education. Knowing the dangers now and making a few small changes could lead to a brighter and longer future. 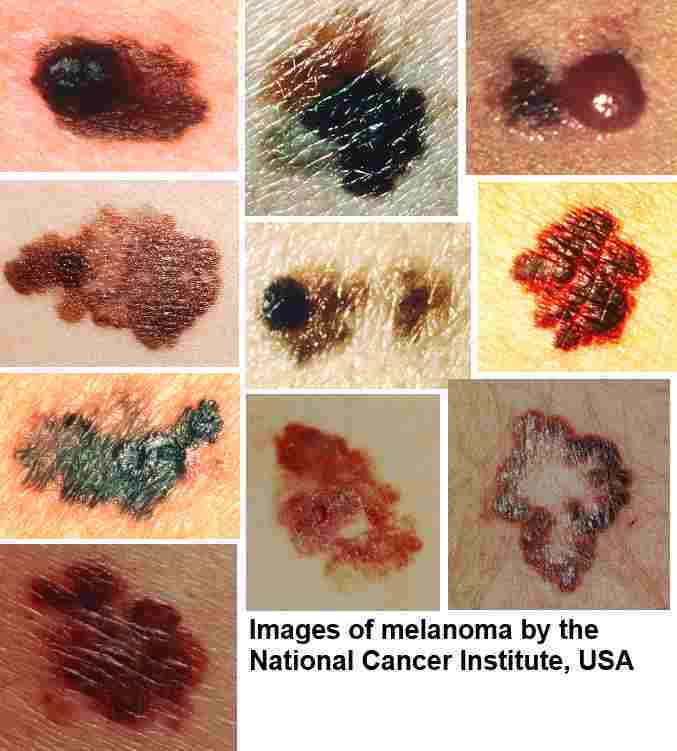 Below you can find images of melanoma by the National Cancer Institute, USA. They can give you an impression of moles that have color change, asymmetry, border irregularity and elevation. When Thomas Leveritt, a photographer and videographer, took photos of passers-by with his special ultraviolet camera, most people were shocked by what they saw. Their seemingly intact skin was all of a sudden exposed as being full of freckles, age spots, and uneven pigmentation. And of course excessive sun exposure can also cause melanoma. The video was called How the Sun Sees You. Some people looked on in horror, and they could hardly believe this was really their face. As a contrast, the skin of young children appeared unchanged when filmed with a UV camera. This showed how we are all born with a perfect skin, but we then let it deteriorate. The video also tried to demonstrate that sunscreen blocks UV rays, and creates a safety barrier. The message was clear: wear sunscreen! Very helpful, have treated several areas of skin cancer with “Indian Herb-Black Salve” with success. None were melanoma. Is good to be able to identify them as they change in appearance and treat quickly. Hi..Im 25 year old n I was diagnosed with fixed drug eruption since im allergic to antibiotics..so without knowing that once I had ofloxicin and the very next day I got a round inflammed rash on my right side of the angle of mandible which after 2 days turned brownish black mark.wen I visited a dermatologist he prescribed me topical steroids and also underwent 8 siitings of Nd-yag laser treatment.but stil the mark dint fade oof.now im scared if wether its a type of skin cancer..plz do help if u can..im tired of visting dermatologists.. Unfortunately I am not the right person to diagnose skin cancer and to give you a medical advice, especially not via the internet. If you are still worried, you will need to search for a second opinion or find another recommended dermatologist that you trust. I don’t see any other way. I am a single mother of 3 children, and my youngest daughter Savannah was born with a mole on the back of her neck below her hairline, I’m a bit worried about it, I haven’t noticed any changes in it, or discoloration……I have gone to my family doctor and she’s supposed to be referring to the IWK Children’s hospital in Halifax, Nova Scotia, but haven’t heard anything back……If anyone would love to see pictures of it, please feel free to contact me and I will for sure pass them along…..
Hi Tanya, if you haven’t heard back then you need to follow it up with a phone call to your doctor or the medical center. Sometimes with all the medical procedure paperwork can get lost so don’t hesitate and follow it up.